At the end of the round, discard Saruman from play. Response: After Saruman enters play, choose a non-unique enemy or location in the staging area. While Saruman is in play, the chosen enemy or location is considered to be out of play. 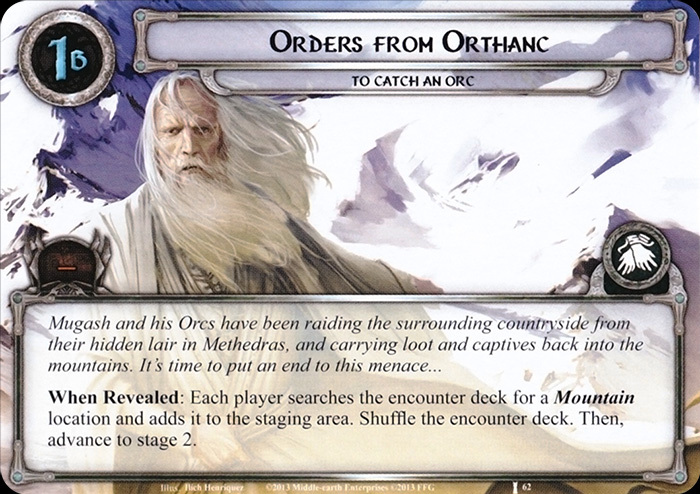 Response: After you raise your threat from the Doomed keyword, ready Orthanc Guard. If free of encounters, the first player gains control of Gríma. Action: Exhaust Gríma to draw a card. If Gríma leaves play, the players lose the game. 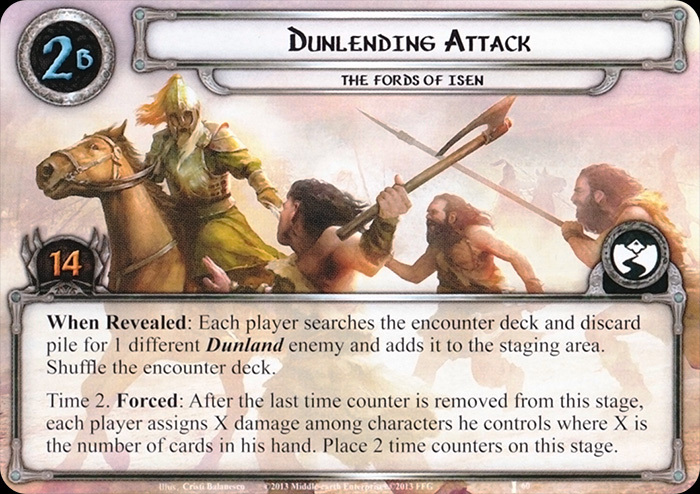 When Revealed: Each player must choose: Either remove 1 time counter from the current quest, or search the encounter deck and discard pile for a Dunland enemy, reveal it, and add it to the staging area. Shuffle the encounter deck. If any player has 5 or more cards in hand, this effect cannot be canceled. When Revealed: The first player draws this card into his hand. Ill Tidings cannot leave that player's hand. 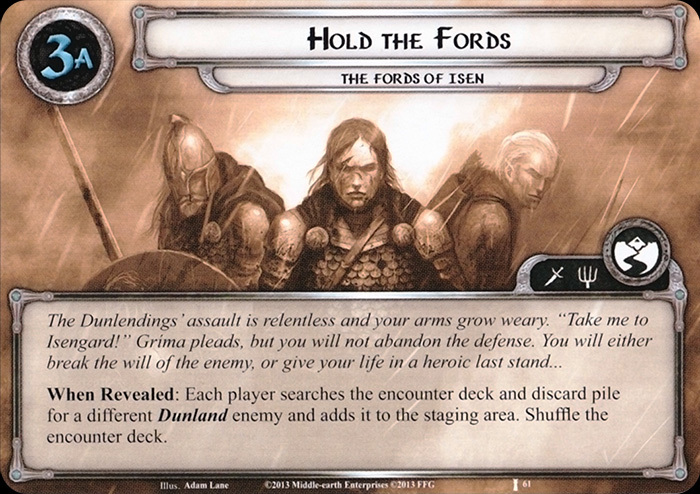 Then, if the first player has 5 or more cards in his hand, Ill Tidings gains surge. When Revealed: Each player searches the encounter deck and discard pile for a location and adds it to the staging area. If the total Threat in the staging area is less than the total Willpower of all characters committed to the quest, each Orc enemy engaged with a player makes an immediate attack. When Revealed: Each Huorn enemy engaged with a player makes an immediate attack. 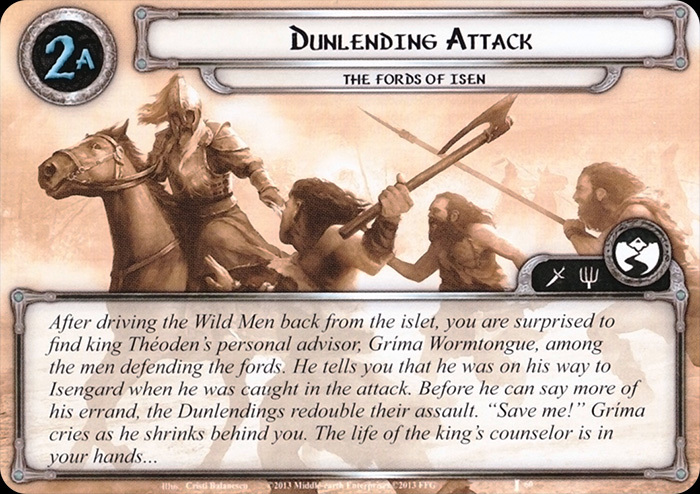 If no attack was made as a result of this effect, each player must search encounter deck and discard pile for a Huorn enemu and pit it into play engaged with him. This effect cannot be canceled. When Revealed: Deal each Orc enemy in play a shadow card. Each Orc enemy gets -15 engagement cost until the end of the round. If there are no Orc enemies in the staging area, Orc Hunting Party gains surge. When Revealed: Either remove 1 time counter from a card in play, or return the active location to the staging area. Shadow: If this attack is undefended, return the active location to the staging area. When Revealed: Either deal 1 damage to each exhausted character, or remove 1 time counter from the current quest. When Revealed: Each player must assign X damage among characters he controls, where X is the number of characters he controls. Setup: Add The Islet to the staging area and attach Gríma to that location. Each player searches the encounter deck for 1 different Dunland enemy and adds it to the staging area. Shuffle the encounter deck. 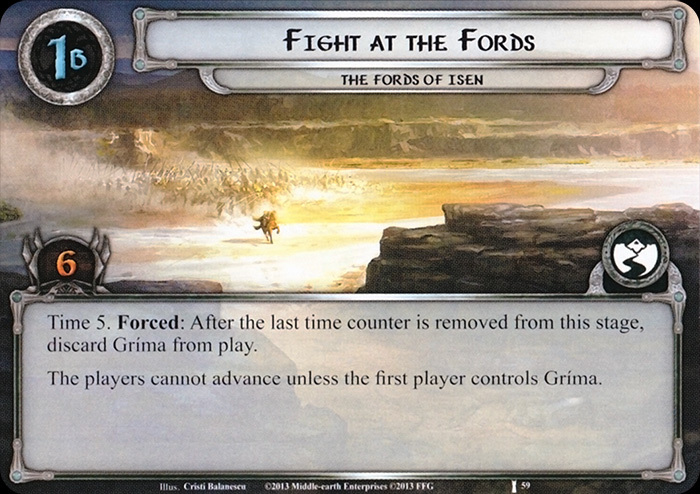 Forced: After the last time counter is removed from this stage, discard Gríma from play. The players cannot advance unless the first player controls Gríma. When Revealed: Each player searches the encounter deck and discard pile for 1 different Dunland enemy and adds it to the staging area. Shuffle the encounter deck. Forced: After the last time counter is removed from this stage, each player assigns X damage among characters he controls where X is the number of cards in his hand. Place 2 time counters on this stage. When Revealed: Each player searches the encounter deck and discard pile for 1 different Dunland enemy and adds it to the staging area. Shuffle the encounter deck. 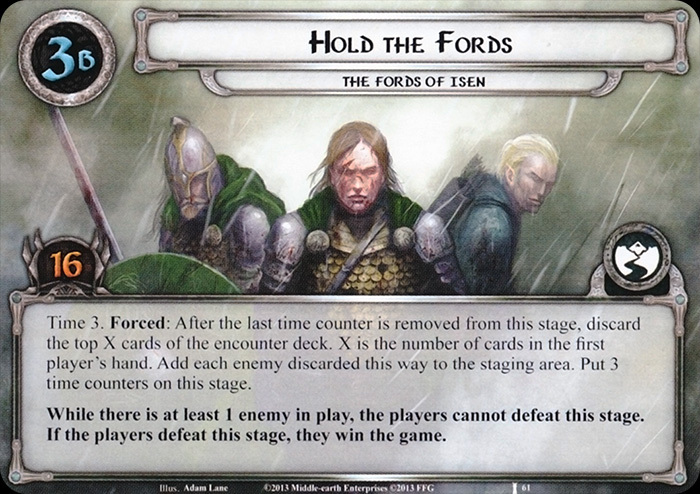 Forced: After the last time counter is removed from this stage, discard the top X cards from the encounter deck. X is the number of cards in the first player's hand. Add each enemy discarded this way to the staging area. Put 3 time counters on this stage. While there is at least 1 enemy in play, the players cannot defeat this stage. If the players defeat this stage, they win the game. Setup: Each player removes the top 20 cards of his deck and places them aside, as an out-of-play deck. The first player takes Mugash plus 1 Mugash's Guard for each other player in the game and randomly shuffles one facedown into each player's out-of-play deck. 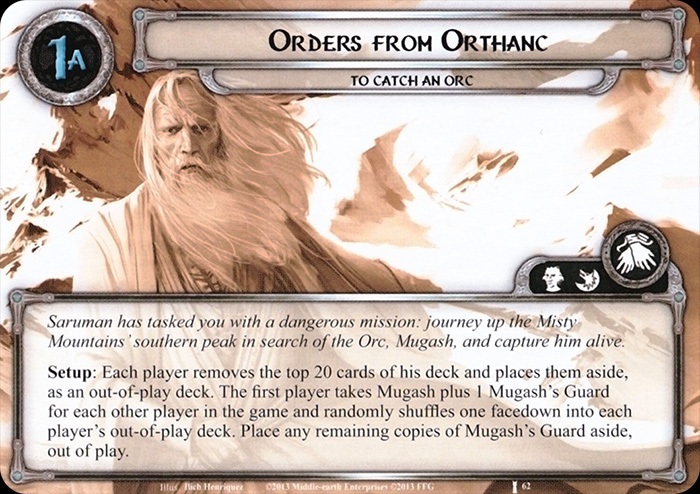 Place any remaining copies of Mugash's Guard aside, out of play. When Revealed: Each player searches the encounter deck for a Mountain location and adds it to the staging area. Shuffle the encounter deck. Then, advance to stage 2. Forced: After the last time counter is removed for this stage, shuffle the discard pile into the encounter deck and reveal 2 encounter cards per player. Place 2 time counters on this stage. Response: After questing successfully, cancel all progress that would be placed on this stage. Then, place 1 time counter on this stage. 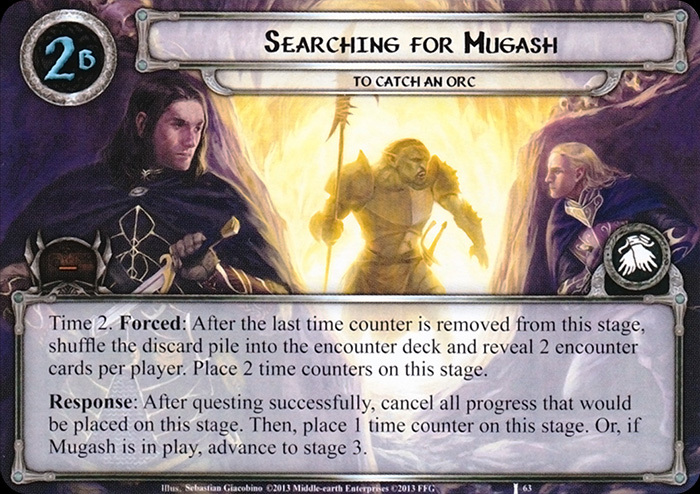 Or, if Mugash is in play, advance to stage 3. Forced: After the last time counter is removed from this stage, return Mugash to the staging area and reveal X encounter cards. X is the number of players in the game minus 1. Place 3 time counters on this stage. Progress cannot be placed on this stage unless Mugash is attached to a hero. If the players defeat this stage, they win the game. 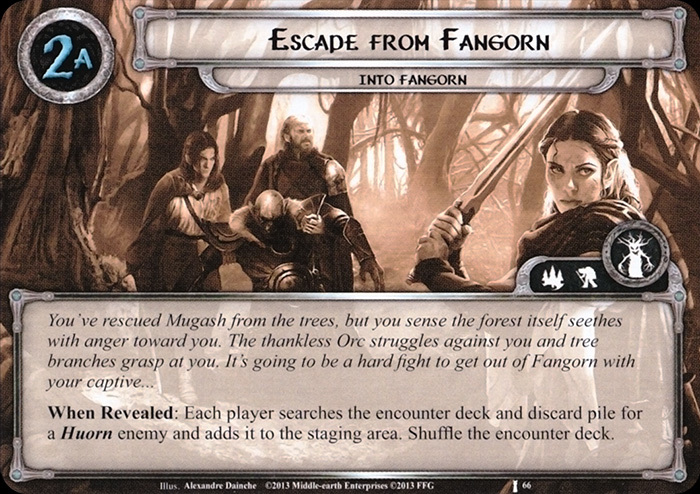 Setup: Add Edge of Fangorn to the staging area and attach Mugash to that location. Shuffle the encounter deck. Reveal X additional encounter cards where X equals the number of players in the game minus 1. 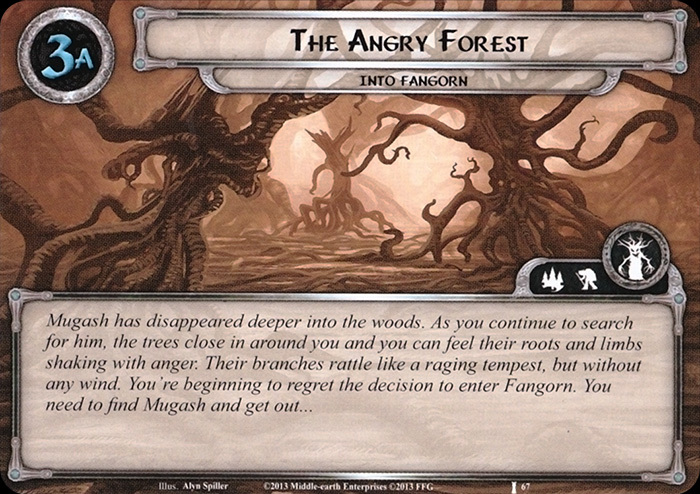 Forced: After the last time counter is removed from this stage, shuffle Mugash into the encounter deck and advance to stage 3. 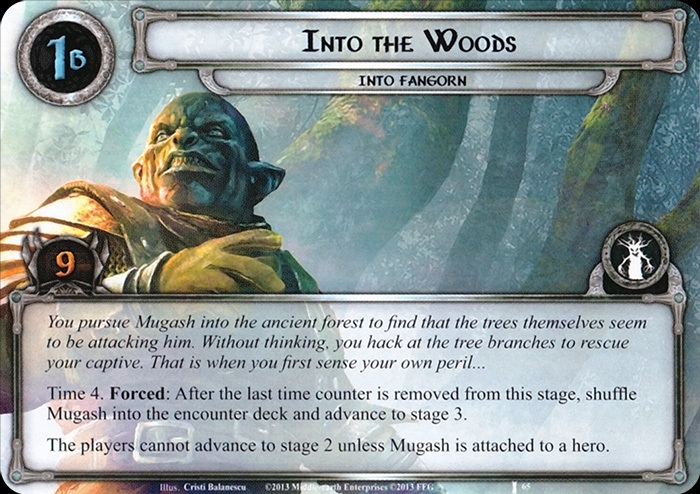 The players cannot advance to stage 2 unless Mugash is attached to a hero. When Revealed: Each player searches the encounter deck and discard pile for a Huorn enemy and adds it to the staging area. Shuffle the encounter deck. Forced: After the last time counter is removed from this stage, shuffle Mugash into the encounter deck and advance to stage 3A. The players cannot defeat this stage unless Mugash is attached to a hero. If the players defeat this stage, they win the game. Forced: After the last time counter is removed from this stage, discard the top 5 cards of the encounter deck. Each player must choose an enemy or objective in the discard pile, reveal it and add it to the staging area. Place 3 time counters on this stage. 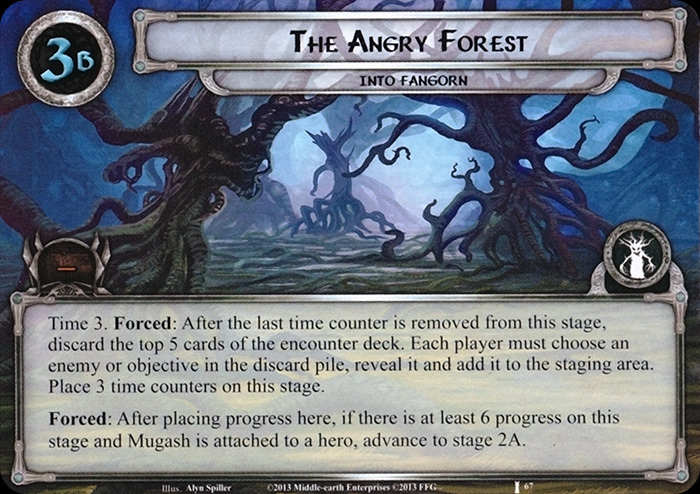 Forced: After placing progress here, if there is at least 6 progress on this stage and Mugash is attached to a hero, advance to stage 2A.